Open House/Meet Our New CEO events were held on April 4 and April 9. Family members, community members and supporters attended to welcome Gabriel Vonleh, MHA, our new CEO. If you were not able to attend, please contact Gabriel at 781-899-1344 x4112 or gvonleh@oppsforinclusion.org to say hello and ask any questions you may have. 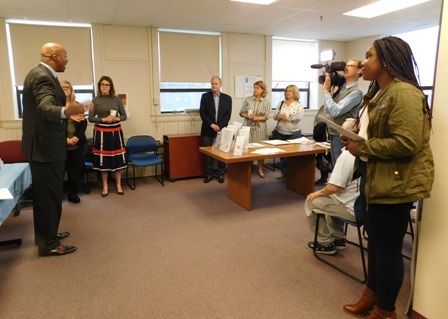 Gabriel Vonleh, MHA, new Opportunities for Inclusion CEO, (above left) greets attendees at our April 9 Open House at Chestnut Street. During the event, Chris Wangler of WCAC-TV, The Waltham Channel tapes highlights of the event for Waltham Newswatch, to be broadcast on 4/11/19. Gabriel Vonleh (center) speaks to attendees at our Open House at 31 Woodland Road on April 4.